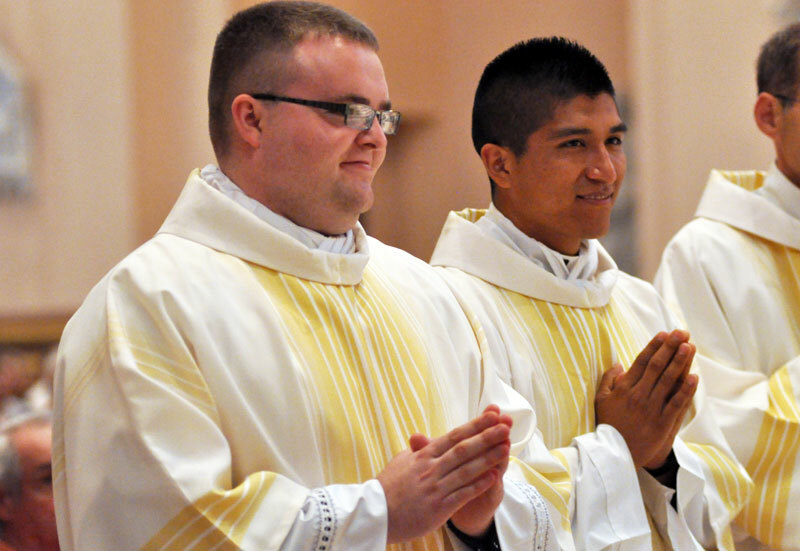 Transitional Deacons Douglas Marcotte, left, and Martin Rodriguez smile during the June 23 Mass at SS. Peter and Paul Cathedral in Indianapolis during which both were ordained alongside 16 permanent deacons. They expect to be ordained to the priesthood in June 2013. (Photo by Mary Ann Garber) Click for a larger version. Two future priests of the Archdiocese of Indianapolis were ordained transitional deacons during the same June 23 liturgy at SS. Peter and Paul Cathedral in Indianapolis during which 16 men were ordained permanent deacons. Deacon Douglas Marcotte, a member of St. Michael Parish in Greenfield, and Deacon Martin Rodriguez, a member of St. Mary Parish in Indianapolis, expect to be ordained to the priesthood in June 2013. Deacon Rodriguez said he was surprised by how calm he was during the liturgy. Many Hispanic Catholics from across the archdiocese came to the ordination to support the first Latino to be ordained a transitional deacon for the archdiocese since the diaconate ordination of now-Father Mauro Rodas in 1964. Both transitional deacons are students at the Pontifical North American College in Rome and only return home every two years. Deacon Rodriguez’s grandmothers both made their first trips outside of their native Mexico to attend the ordination. It was the first time in more than a decade that Deacon Rodriguez’s parents had seen their mothers. Irene Marcotte, Deacon Marcotte’s mother, was moved when she saw Bishop Christopher J. Coyne, apostolic administrator, ritually lay hands on her son’s head. Deacon Marcotte was pleased to be ordained alongside 16 permanent deacons. Deacon Rodriguez was impressed by the permanent deacons’ choice to be doubly committed in their lives of faith. At the same time, permanent Deacon Richard Cooper of St. Mary Parish in Lanesville said being ordained alongside two future priests put his own ministry in a broader context.